A few clouds. Low 54F. Winds NNW at 5 to 10 mph..
Printville employees Joel Harmaning, Dee Cromer, Bobby Angell and Cody Hix offer cider to customers outside the shop at Biltmore Park Town Square. Printville at Biltmore Park Town Square is the first shop that owner John Long opened in 2009. It offers comprehensive printing services from large to small projects. Printville Manager Dee Cromer checks a large document she is printing for a customer. This image in the Print Buyer’s Guide of Printville reflects the quality of work. On a busy morning Printville Manager Dee Cromer and her co-worker are helping a steady stream of customers coming into the shop at Biltmore Park Town Square. Cromer assists a customer with copying a large document while Project Manager Bobby Angell talks with another about details of a print order. Others are stopping by to drop off mail and packages for pick up by the U.S. Postal Service and FedEx later in the day. Printville offers a comprehensive range of services from large, wide-format banners to signs and printing of books, brochures and manuals—as well as business cards, calendars and decals. Many of the clients who come to Printville are entrepreneurs and contractors, Cromer says. However, the shop serves a broad range of clients with widely varying needs. “We run the gamut from walk-in customers to colleges,” Cromer says. Holding a bound book filled with photographs, Cromer talks about the quality of work that Printville produces. The images in the book are sharp and clear with highly-defined details. Before embarking on a project, customers meet with a project manager and an in-house estimator for discussion of its scope, Cromer says. These preliminary discussions ensure that the customer will get the product he wants. “We’re not just going to dive in,” she remarks. If a project comes in “bare bones with only an idea,” staff at Printville, which includes designers, can take it from inception to finished product. Design services include layout, typesetting and logo and brand development. Printville has a “pre-flight” and proofing process so that any issues can be resolved before the finished work is completed. “This is one of our strengths,” Cromer says. If, for example, a client brings in a photo with a low image quality to be displayed on a large banner, the Printville staff can help resolve the problem, perhaps by suggesting another photo to use. 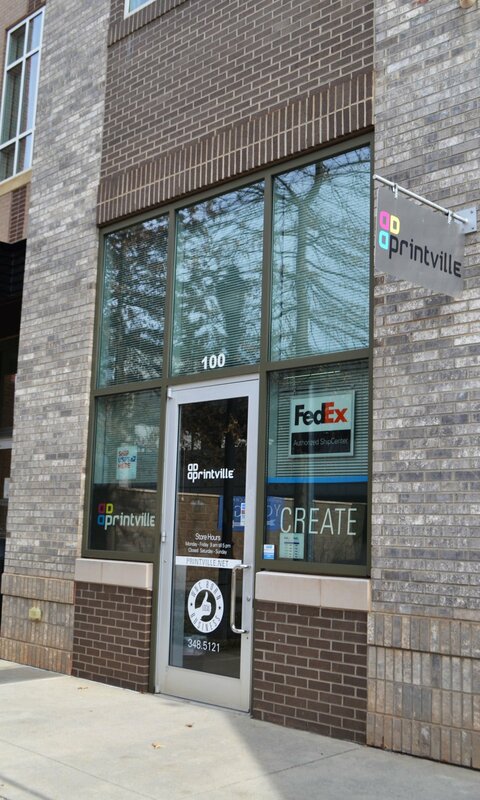 Each of the six area Printville shops has same-day printing services for small projects. Larger projects such as book and brochure printing are done at the production facility in the Fletcher shop. And wide-format banners are created at the Grove Arcade location in downtown Asheville. Printville offers a selection of materials for banners from various types of vinyl to wall film and canvas. For printing books, newsletters, catalogs, note pads, business cards, flyers, inserts and booklets, there are many options in paper stock and coating choices from satin to glossy and uncoated listed in the company’s Print Buyer’s Guide. Printville at Biltmore Park Town Square is the original shop that owner John Long opened in 2009. 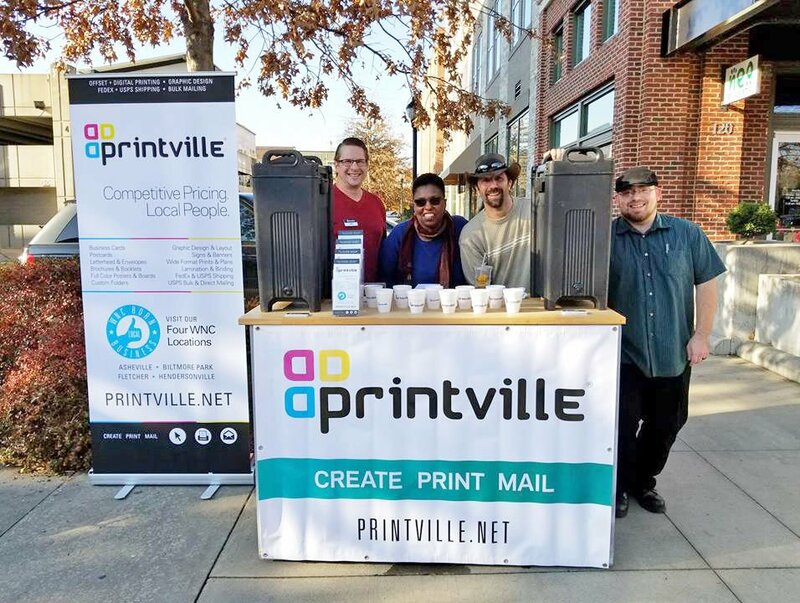 In the past 10 years, Long has opened other Printville shops in downtown Asheville, Hendersonville, Fletcher, Brevard, as well as a recent one in Gaffney, South Carolina. Co-founder Nathan White has assisted Long in the development of Printville shops. “We are locally born and raised—and still being nurtured,” Cromer says of the growing enterprise. As an employee, Cromer says she feels valued by the owner who has fostered an environment of team effort, which translates to customers in a positive way. Long and Printville employees are also active in the community, participating in events and festivals, she notes. Printville, at 2 Town Square Blvd. in Biltmore Park Town Square, is open Monday through Friday from 9 a.m. to 5 p.m. For more information, visit the website at HYPERLINK “http://www.printville.net” www.printville.net or call 828-348-5121.